Cats are the Funniest People - just ask me, I'll tell you. 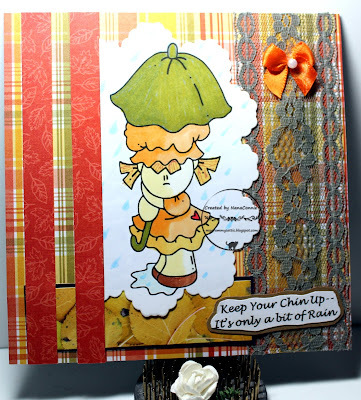 :-D My card today for the newest challenge at QKR Stampede proves the point. 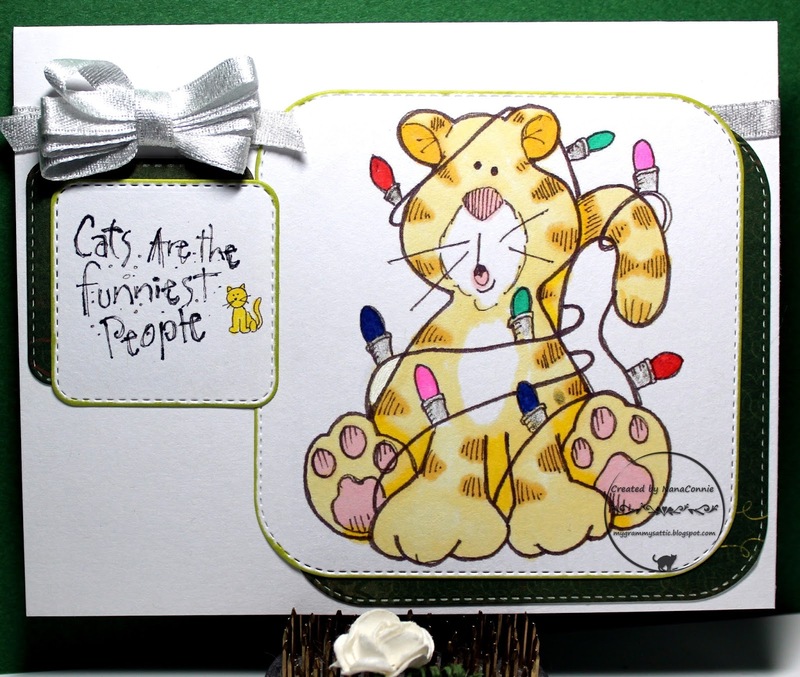 I used a fun image called "Christmas Lights Kitty" and the sentiment is called "Cats Are." I colored this one with ProMarkers, then cut it with a die from Cottage Cutz. I cut the sentiment and both offset, matting pieces with dies from that same set. The silvery ribbon and handmade bow sparkle IRL, adding to the holiday feel of this otherwise very simple Christmas card. 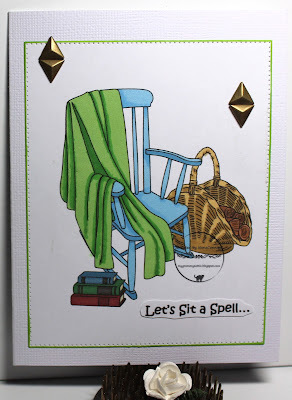 I colored with watercolor pencils and gamsol, then cut the image with a stitched die from Lawn Fawn. 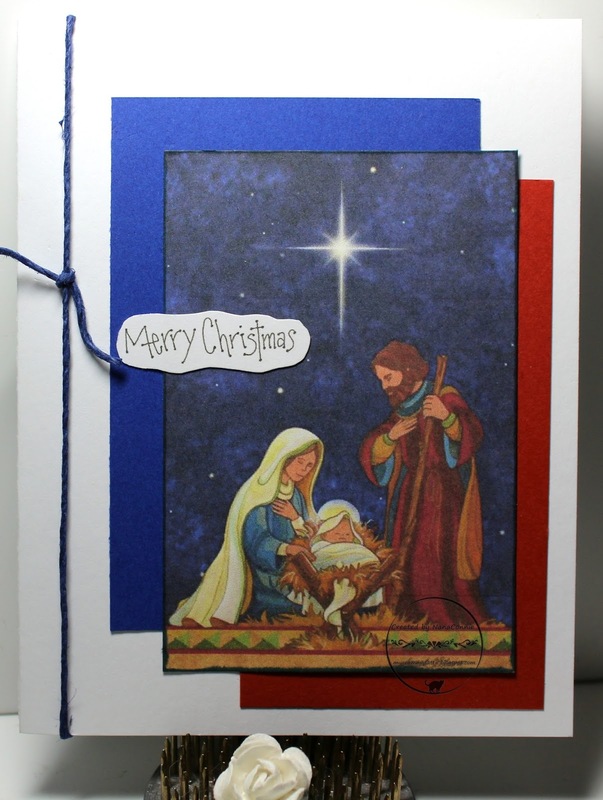 I matted that with blue CS and added two scraps of red CS to a couple of the corners. The musical score paper came from my stash (it may have been Bo Bunny) and I wrapped it with red, snowflake ribbon. The sentiment was in my stash from QKR Stampede. 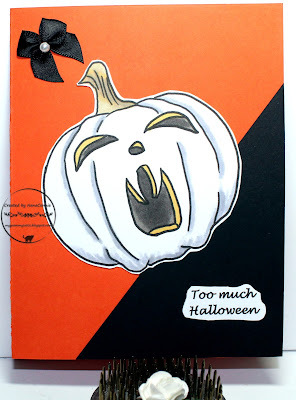 This morning I have a fun, spooky Halloween card to share. 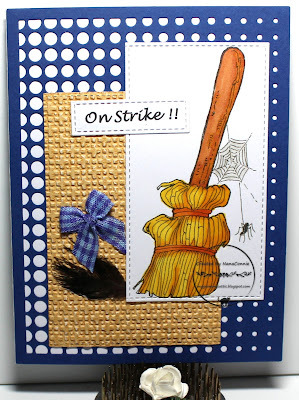 This is one of those 'git 'er done' cards that took very little time to make. I think I spent more time planning the design than I did putting it together. No coloring on this one at all and the two main characters are buttons! 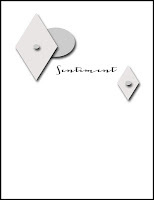 They add great dimension to the card. 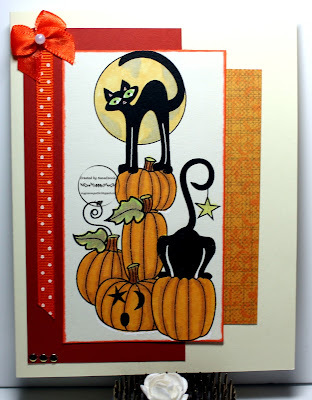 The background is just a black card blank and I found a scrap of orange CS, trimmed it to size, wrapped it with an orange & black ribbon, and put it onto the card front. I used craft glue to adhere the button characters after adding the ribbon sentiment. The bat & moon and the black cat are flat embellishments but they added a bit more interest to an otherwise CAS card. My daughter adores owls and has collected them in many forms for several years now. 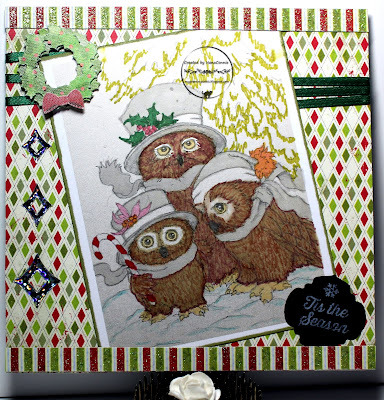 I tend to think of them as creatures for fall but when I got this image (kindly stamped for me by a friend), I knew it would be perfect for her Christmas card this year. 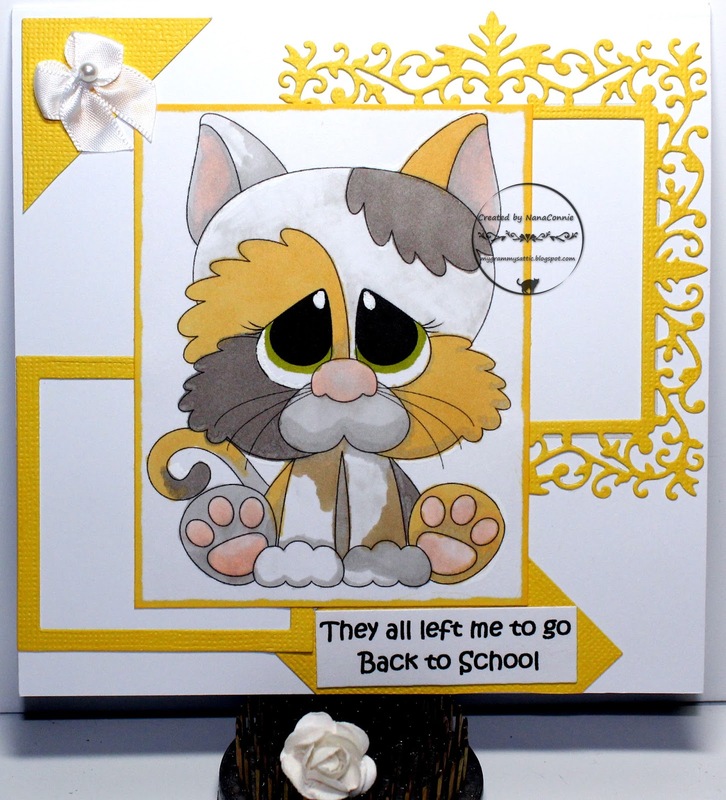 I used ProMarkers to color the image, then cut it with my Fiskars paper cutter and inked the edges. 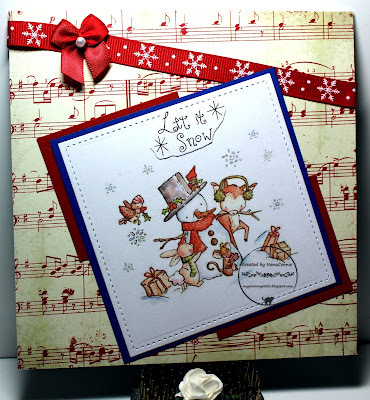 I chose papers from my favorite Christmas pad, "Father Christmas" by Bo Bunny. It has such perfect shades of red and green, along with the light distressing which make delightful Christmas cards. I added three wraps of very narrow, green, satin ribbon before layering on the image piece. I cut two strips of stripped paper, glittered and embossed, and put those along the top and bottom. The sentiment is from a kit I purchased a few years back, and the little wreath had been in my stash since last year. For a tiny bit more sparkle, I added the diamond-shaped "gems" and at that point, it was finished. I'm doing a really quick post this morning because I want to share a Halloween card I made yesterday but I have made a commitment to get birthday party invitations done for my grandson's birthday and my daughter will be here in a couple of hours to pick them up. Yikes! 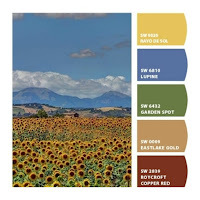 It's time for some of those luscious yellows and oranges that are my favorite fall colors. This is one of those images I printed or stamped who knows how many years ago and it was in my folder of "Color These Someday." Unfortunately, I made no notation of any kind about where I got it but it must have been a borrowed stamp because I don't recall ever having one like it. I used colors from House that Stamps Built. 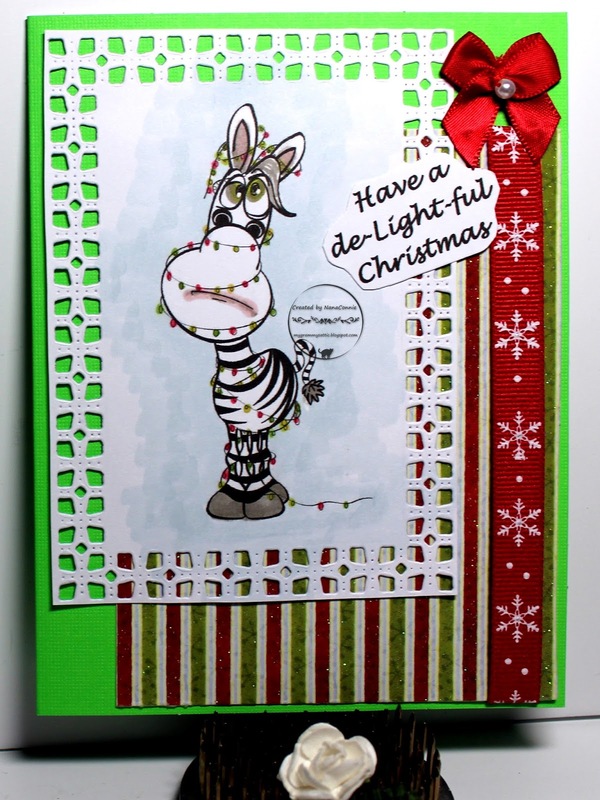 I colored with ProMarkers and cut it into a tall and skinny rectangle with a Spellbinders die, then inked the edges. That die was shorter than I wanted for this image so I cut halfway along the image, then shifted the die and cut halfway again from the opposite end, getting the exact length I wanted. It's amazing how you can increase the options you have just by adjusting how you have the dies laid onto the papers. The golden plaid dp was cut with that same Spellbinders die (actual size this time) from a scrap I found in my collection of fall-colors paper and the dark orange is a scrap of CS from the same box. I had left over, orange, polka dot, ribbon so I cut a short bit and added it to the top of the CS. I used a bow that was white, dyed it with my ProMarkers, and used it at the cut end of the ribbon. I added three tiny metal brads and it was done. Hey, folks, it's Friday again and that means another challenge is starting at QKR Stampede. 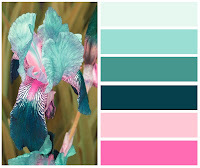 It also means that I'm very late writing up this post but not so late that it won't go live on time. 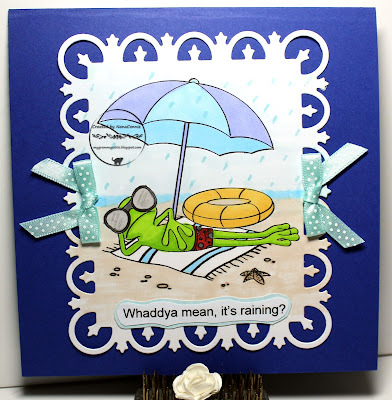 :-D As always, our theme is "Anything Goes" and the optional theme, if you want to use it, is "Embossing" -- wet or dry. This QKR image (Parked Broom) always tickles me. I'm sure it was meant to be used for Halloween but at my house, it's been enlarged, colored, and made into a poster which I can hang on the broom closet door whenever I feel more like crafting than cleaning. For today, I used it on a card. 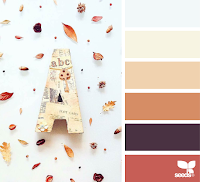 I colored those lovely autumn golds and oranges with ProMarkers, then die cut the image with a stitched rectangle die from Die-namics. 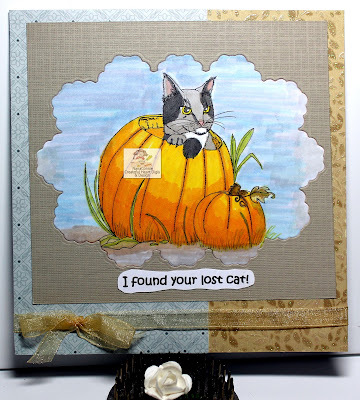 I found a scrap bit of pale orange CS, ran it through a "Lattice" folder by Stampin' Up, and used it offset behind the image. The blue background was cut with a die from Altenew (one of my new favorites which I dig out whenever possible!) 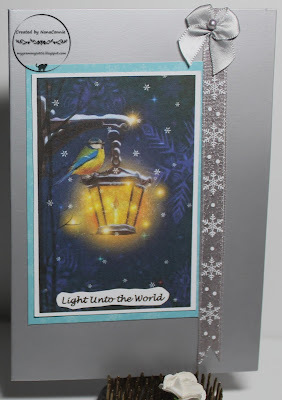 and I layered that onto a white card base before adding the rest of the pieces. I managed to collect a short bit of plaid ribbon and tied a bow, then added a bit of black feather and called it finished. This card really showcases the run of luck my neighbors have been having and I know they'll appreciate it. They came by last evening to borrow a couple of folding beach chairs, deciding that one last sunny day at the beach before the Autumnal Equinox hits us here in California would be perfect. We've had such a miserably hot summer that they had opted not to do anything much all summer long so this was to be their one and only day-trip before fall hits. 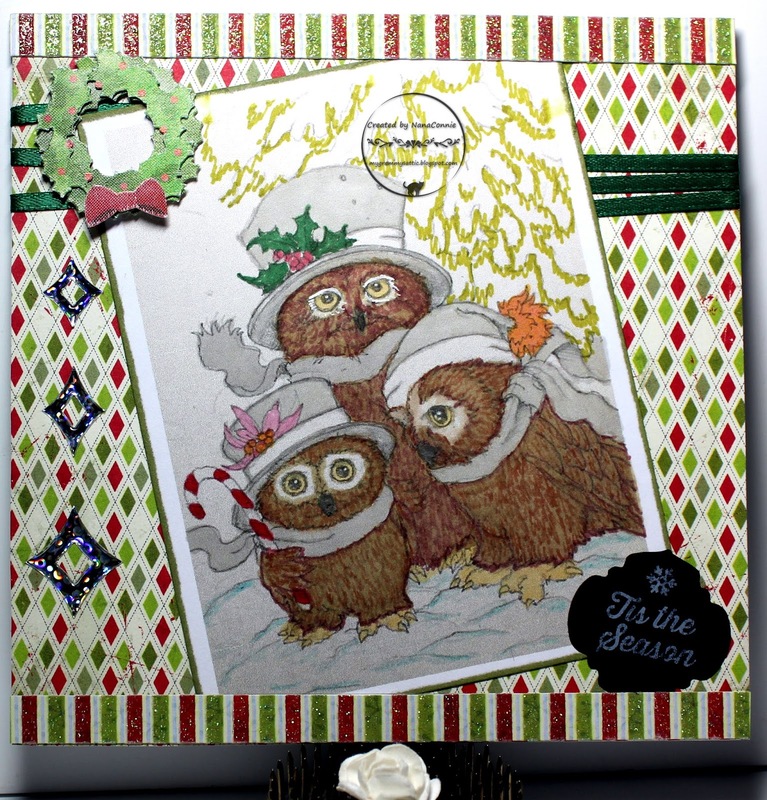 I used ProMarkers to color the image then cut it with a die from Spellbinders. I kept everything very simple, putting the image piece onto a dark blue card front and adding only the two polka-dot bows. The sentiment was printed, hand cut, matted, and hand cut again. Many years ago, I had a dear friend who celebrated "Not My Birthday" exactly 6 months after her birthday. That was my first introduction to what today is called an "UnBirthday." But now I have a friend who says birthdays stopped being fun when she was too old for childhood birthday parties and she simply refuses to celebrate (or even tell anyone) when it's her birthday. So, this card is for her and may she have many more "Not My Birthdays." The image is by Rick St. Dennis and I colored it with ProMarkers. The two side cuts were done with a border die from Spellbinders and I had to carefully line up the top corner where the cuts meet in order to get the scallop. I did that by lining up the hole in the middle of the scallop. I used shiny purple paper for the card front and then found charcoal CS to use as the background for the image piece. 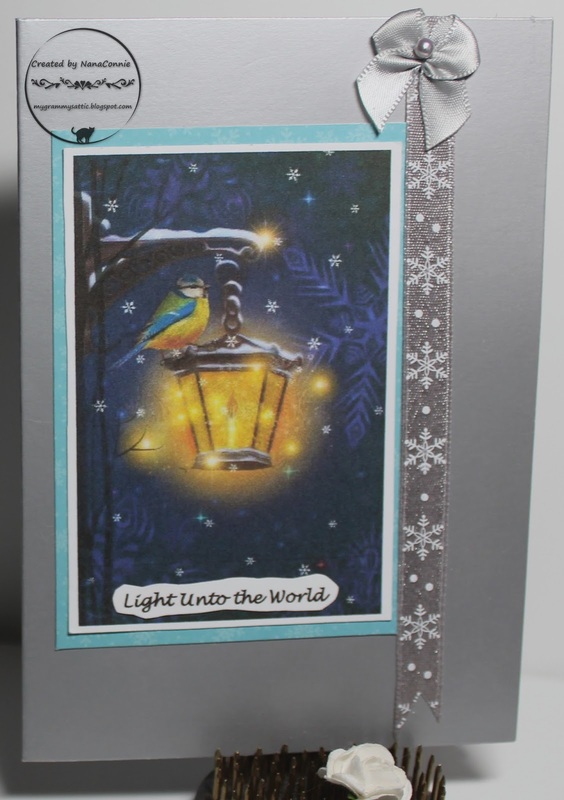 I layered those together, wrapped with sparkly, silver ribbon and added the image on top. The little silver bow was the only added embellishment. When I got this image for the Facebook Progressive challenge at Limited Runs, I laughed out loud! Let me show you the card first, then I'll give you the story about laughing over it. I've become friends with a lady who lives on the same street and we have a running joke about "Crazy Cat Lady" and "Crazy Dog Lady." Just to keep things in perspective, I am (currently) owned by 2 cats and she owns 3 dogs - all small ones, I admit, but come on -- how did I become a crazy cat lady with fewer cats than she has dogs? 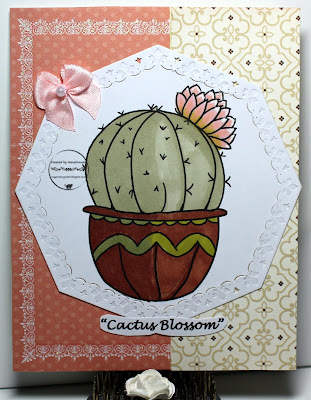 In addition to that, one of her dogs is named "Cactus Blossom" ! Whaaat?? When I asked her why, she said, "Well, I don't really know. But she answers to it." The image was printed onto a scrap of white CS, then colored mostly with ProMarkers but a khaki green Copic snuck in there somehow. I cut the image with a die from Spellbinders. The background is made from three pieces of scrap dp, one of which is pieced together to look like one piece. The pale orange dp is embossed and glittered. I made the bow just for this card and used the scrap end of some pink ribbon, barely having enough to tie one of my standard hand-sewn bows. 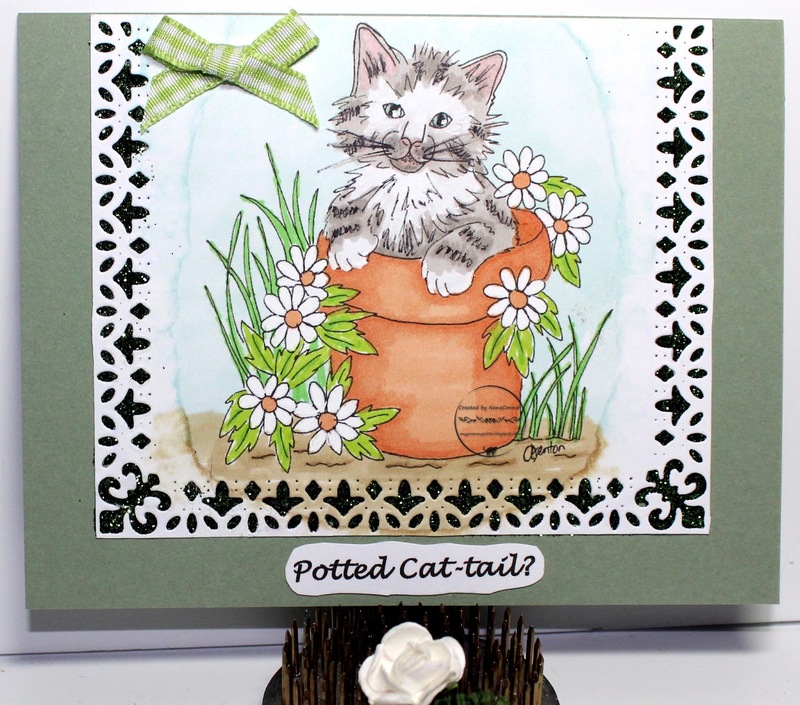 I have two cards to share with you today - both of which I made this morning and I couldn't decide which one to share today so I'm sharing both of them in the same post. 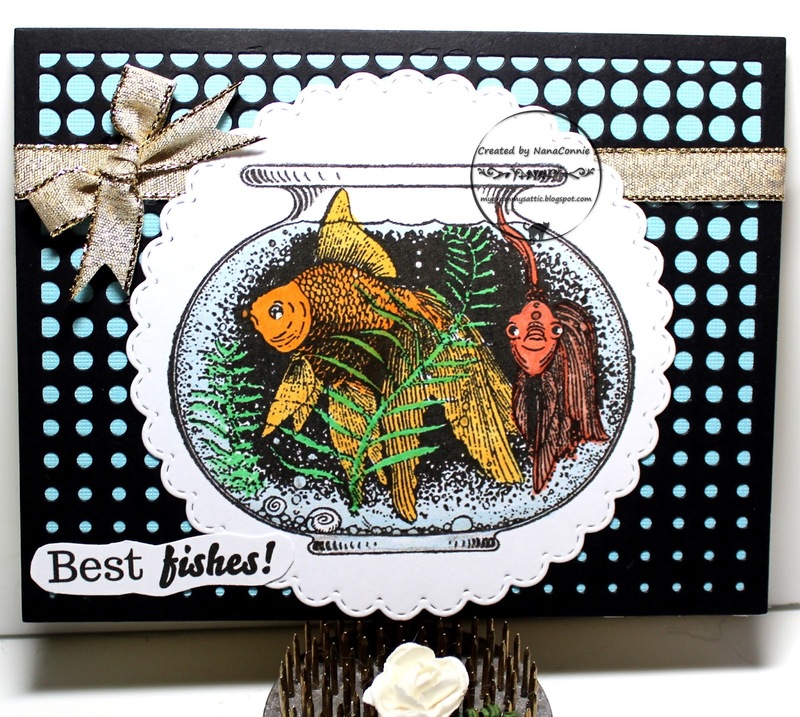 This first one features an image from MHK Designs and I can't remember the last time I did an image with such gorgeous fish in it! although my "pink" turned a bit coral. I colored the fish bowl and fish with ProMarkers and chalks, then cut the image with a stitch, scalloped die from Memory Box. The black background piece is cut with a die from Altenew and I love the way it gives the impression of bubbles in water. I found sparkly, silver ribbon in my stash and used it to wrap the card front and tie the bow. The sentiment is from the same MHK Designs set. 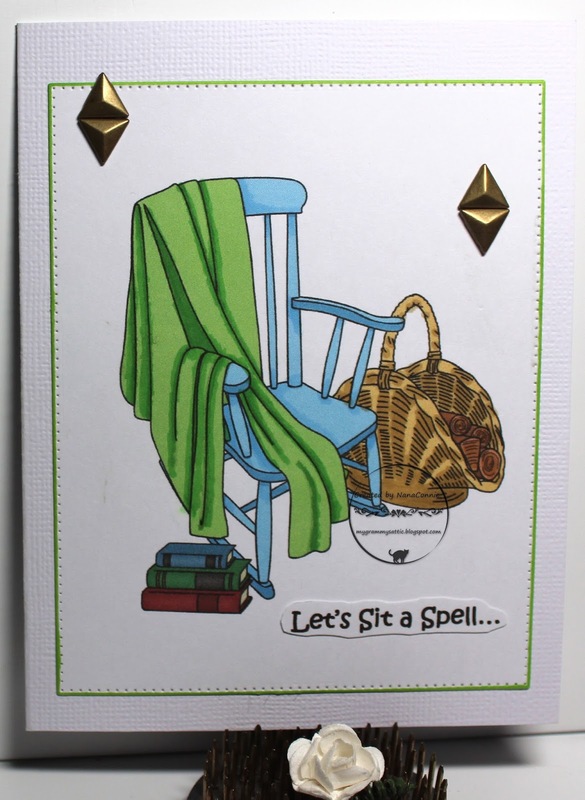 Again, I used my ProMarkers to color the image, sticking with ocean blues and greens, and this time I die cut it with a die from Spellbinders. 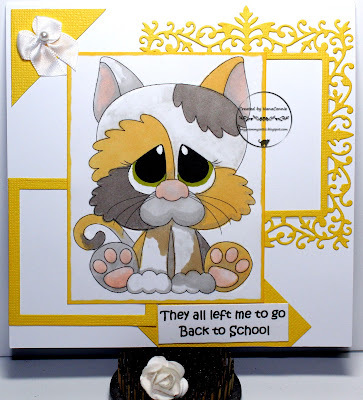 I added strips of double sided tape and used loose glitter to make all the sparkles around the frame. I kept everything very CAS, adding only two scrap strips of embossed ("Linen" folder) CS and one tiny bow which I dyed to match with ProMarkers. Today we start a new challenge at QKR Stampede with our usual "Anything Goes" theme and our optional theme is also Anything Goes so how can you not play along this week? 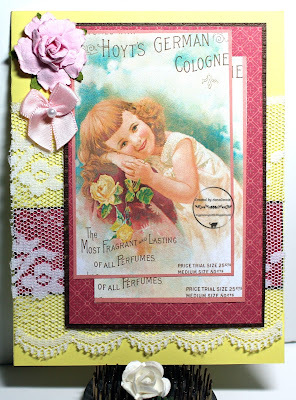 I chose an image from our sister shop, Eureka Stamps, and it's called "Rose." 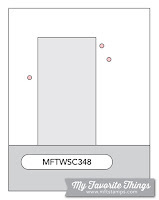 You can't get any simpler than that so I've done a very simple card design to go with it. 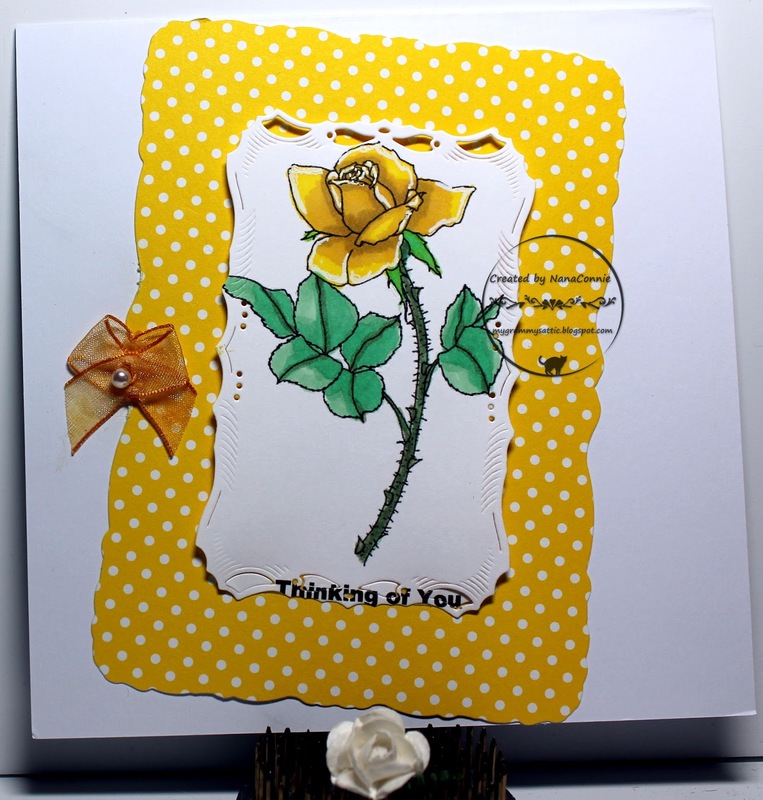 The rose is colored with my ProMarkers, then cut with a die from Spellbinders. I cut the polka dot piece with another die from Spellbinders and mounted the rose on dimensional dots before layering it onto the dp. Both of those pieces went onto a white card front and I added the sheer bow with a gold pearl for a single embellishment to keep the card CAS. Limited Runs has this happy Christmas bulb as the image for their current Progressive Challenge. This time, I printed the bulb twice, then colored with Pro-Markers and a silver paint pen, and fussy cut them. The green dp with the leaves is an old one from Bo Bunny and the other one is from Recollections. Both have been in my stash for a while and both pieces were scraps. I added the printed sentiment and a white bow, then made a glittered paper bow with a single gem to put on top of the white bow. but I shifted the horizontal piece upward. This image is from Angie's Digital Stamps and I colored it with my ProMarkers. Both the image and the beige frame were cut with a stitched die from Die-namics and the image is inlaid into the frame. I matted that with some olive green CS which I ran through my "Linen " embossing folder. 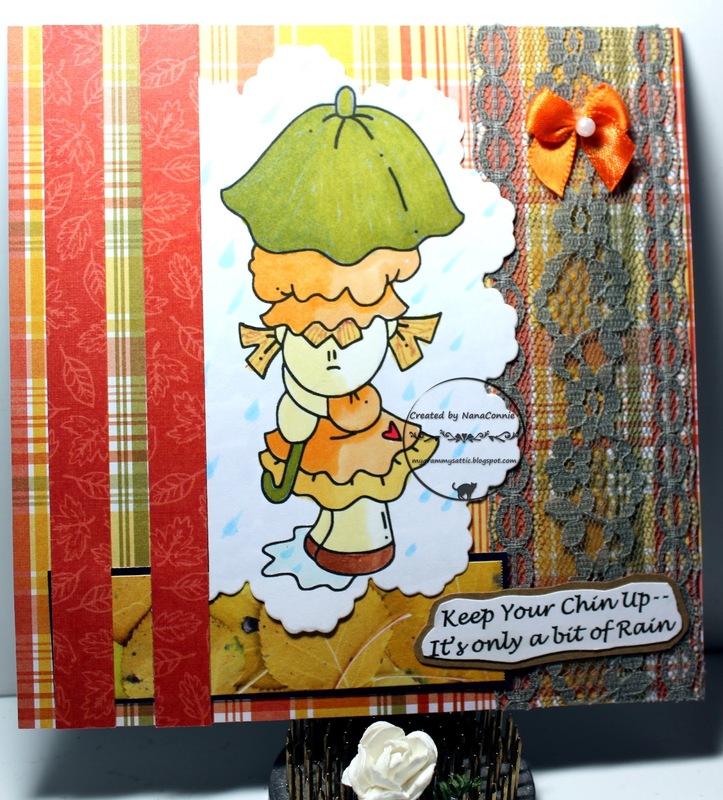 Both papers are from the "Autumn Leaves" stack by DCWV and the yellow leaves dp is also matted with die cut beige CS. 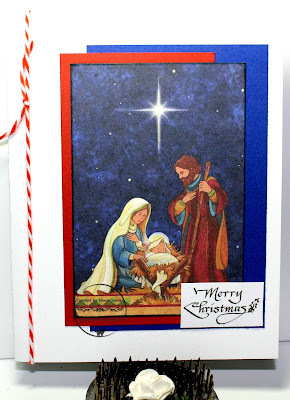 With the exception of the green background paper, everything else on the card was cut from scraps. Finally, I added a hand tied bow made from burlap ribbon. 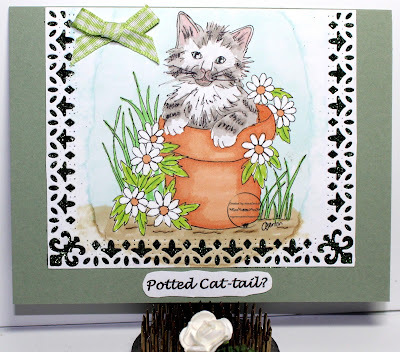 If you take even the briefest glance at my sidebar, it's obvious that I love cats so whenever I find a new feline image, I have to use as quickly as possible. This one is from Sasayaki Glitter and I just know this is the Fairy Godmother for a rambunctious, unstoppable cat who's probably out testing one of his nine lives. Just look at the expression on the face of the Fairy Godmother Cat as she watches him tempt fate - yet again! I colored this with my ProMarkers, then cut it with an Unbranded die. The sentiment is a computer font and I cut it with another of the dies in that same set. 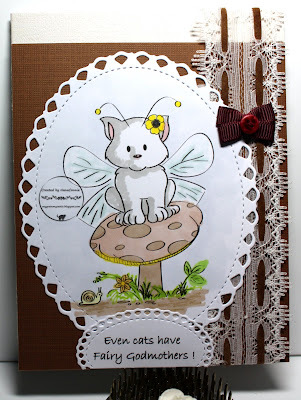 The lace with the brown ribbon has been in my stash for a while and it just worked so well against the "Linen" embossed brown and beige card stocks on the card front. I added the double loop bow decorated with a tiny button. When I found this fun and funny jack-o-lantern in my collection of Limited Runs images, I thought he looked totally worn out by all the Halloween festivities and, rather than looking very scary, I thought that looked like the biggest pumpkin yawn I'd ever seen. :-D So, I decided to get one more Halloween card out of the way. It'll be time to mail them before we know it! Last year, I saw white pumpkins in the stores for the first time. I know they've been around for years and popular for at least the last decade but that was the first time I'd seen them in my local stores. Being influenced by that, I decided to color only the shading and the stem with my ProMarkers and the end result was this beautiful white pumpkin. It's fussy cut - no dies and no electronic cutters. 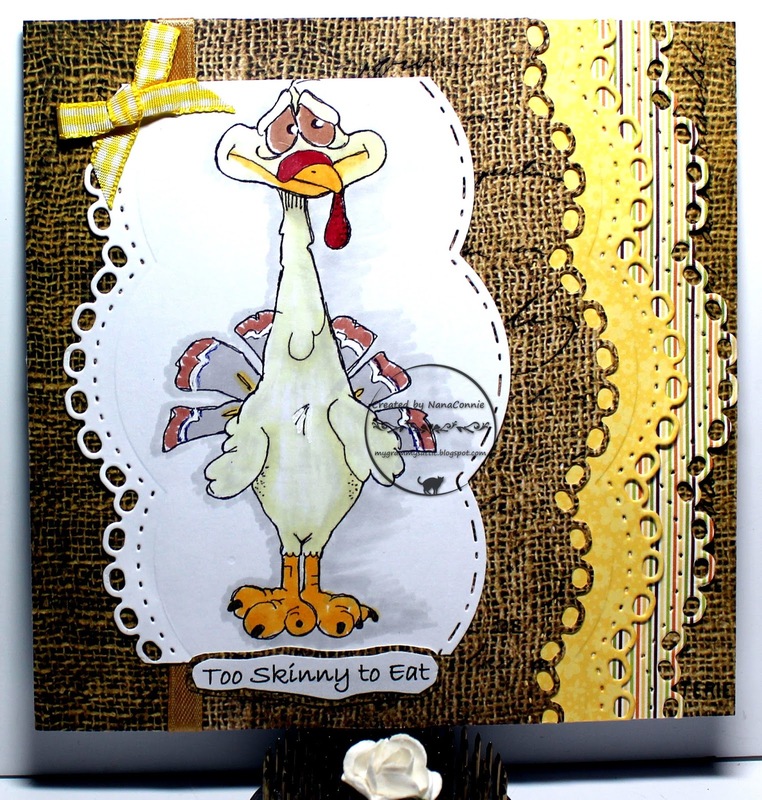 The background is done with two scraps of CS which were on my craft table and I used them instead of discarding them into the trash. I printed and hand-cut the sentiment, then added one of my hand-made bows. This one will be CAS, flat, and easily mailed. 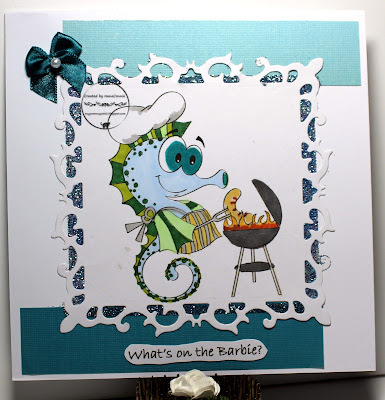 I colored him with my ProMarkers and used two different border dies from Spellbinders to cut him out. 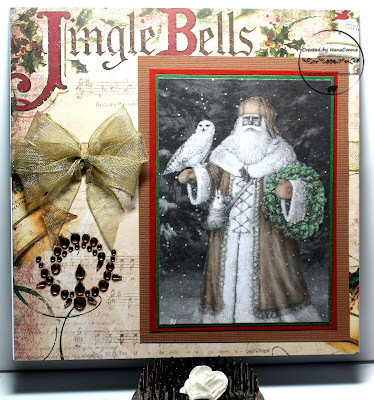 I chose three different papers and used one of those border dies on them, then layered them to make the background. 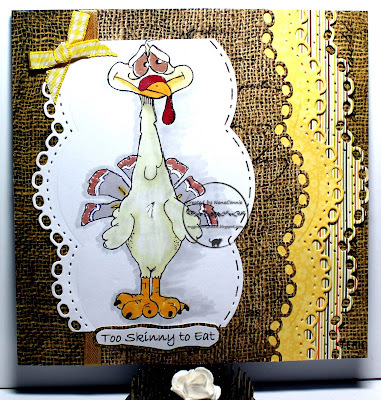 I wrapped the layered papers with gold satin ribbon before adding the turkey image. I tied a little bow using yellow gingham ribbon and then left it at that. It's a card which will work well for one of the many guys in my family where gals are outnumbered nearly 2 to 1. You know I make a lot of guy cards! 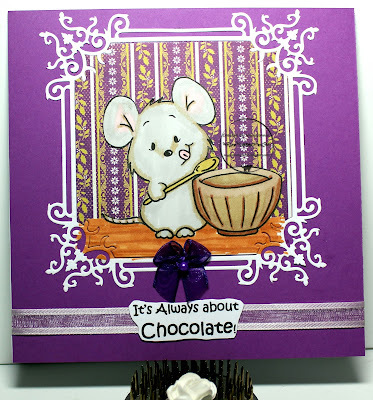 Each month I play along in the Progressive Challenge at Gerda Steiner Designs and this cute little mouse is the image for the September challenge. What better than a chocolatier working away the hours in his kitchen, especially when he's making fancy chocolates just for me?! I can smell the melting chocolate from here in the craft room! I colored with my ProMarkers and used a die from Spellbinders to cut the image. That die happens to cut the image and makes a frame at the same time. I took the image piece and fussy cut around the top 3/4, basically from the floor upward so that the mouse and his bowl were standing alone, with no white paper aroundthem. 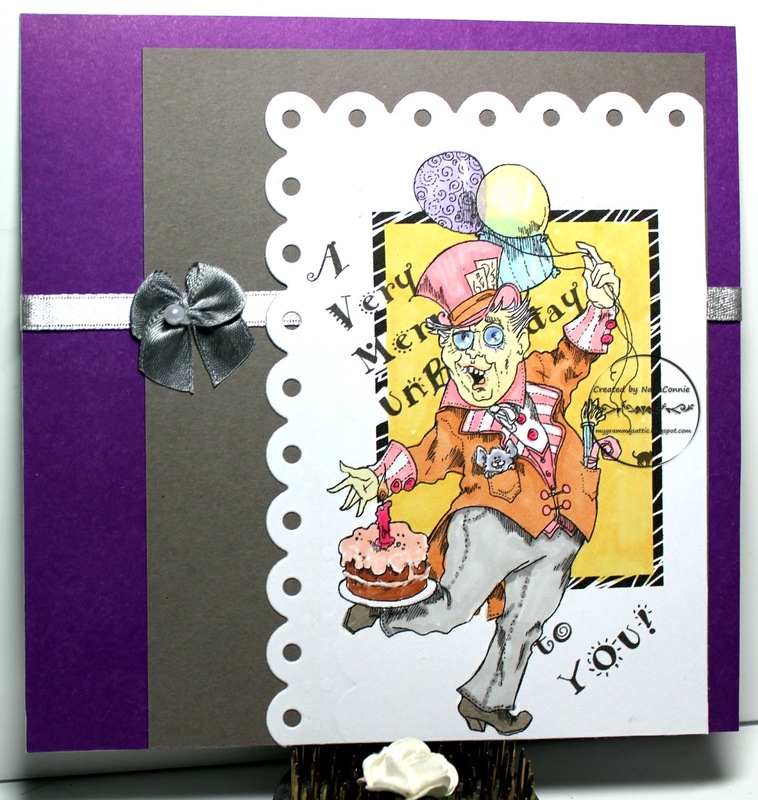 I used deep purple CS for the card front, wrapping it with a piece of satin-border, sheer ribbon. I added the framed image and the sentiment and called it finished. 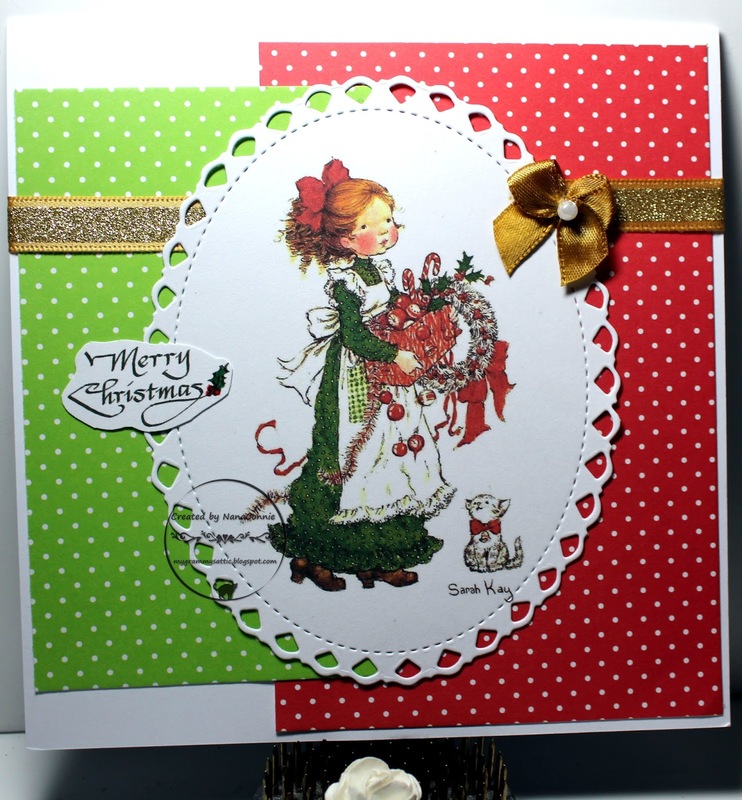 I used a gray-green card base, added a bow made from gingham ribbon, and finally printed the sentiment and added it. 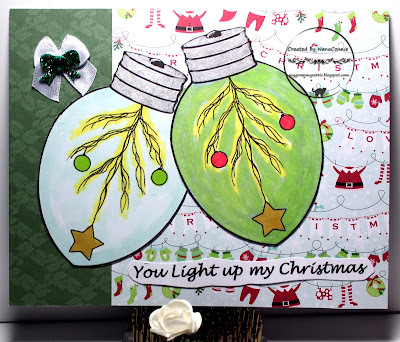 I love everything about the Christmas holiday - making cards, planning menus, wrapping gifts, making personalized tags for them, decorating... hmmm, maybe not the decorating part so much, at least not when it comes to lights on the tree. :-( I think this poor zebra agrees with me on that one! The image is from Sasayaki Glitter's Progressive challenge on Facebook. I colored with my ProMarkers and cut the image with a die from Cheery Lynn. 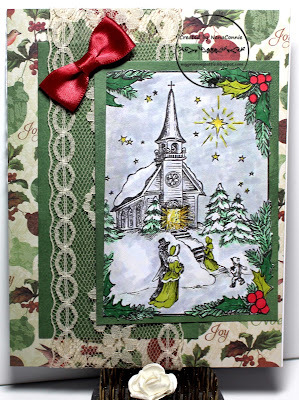 The striped paper is embossed and glittered, and the red snowflake ribbon was in my stash. The bow is one of those I sew together by the dozens to have ready as needed and I dyed it red with a ProMarker. What's the first thing that happens when new crafting supplies arrive in the mail? We sit right down and make something with them, right? Well, I had ordered some new dies and they were waiting for me when I got home which gave me an excuse to do crafting (instead of doing house work and a load of laundry) and this is the result. 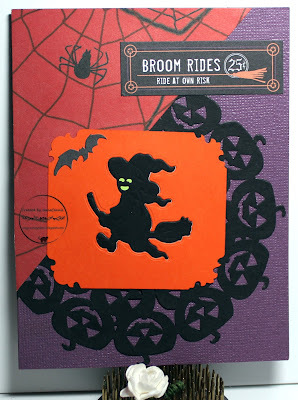 This one is all die cuts and papers so it was really quick and easy. 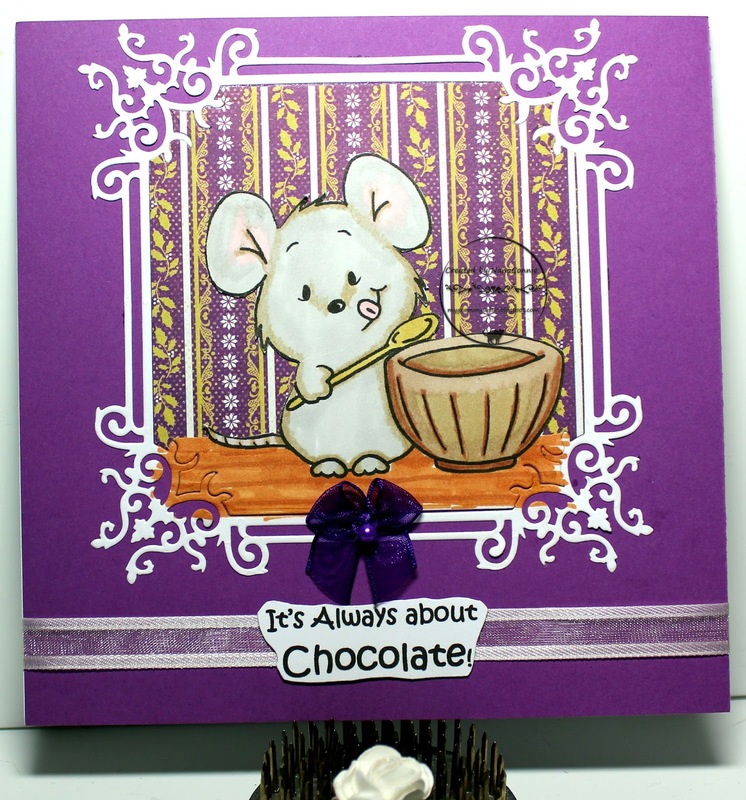 The card base is made from purple CS which I ran through my "Linen" embossing folder. The black witch is done with a die from Yvonne Creations and I also used it on the orange frame so the image is inlaid into the frame instead of being adhered on top of it. The pumpkins were created with a die from Die-mensions. 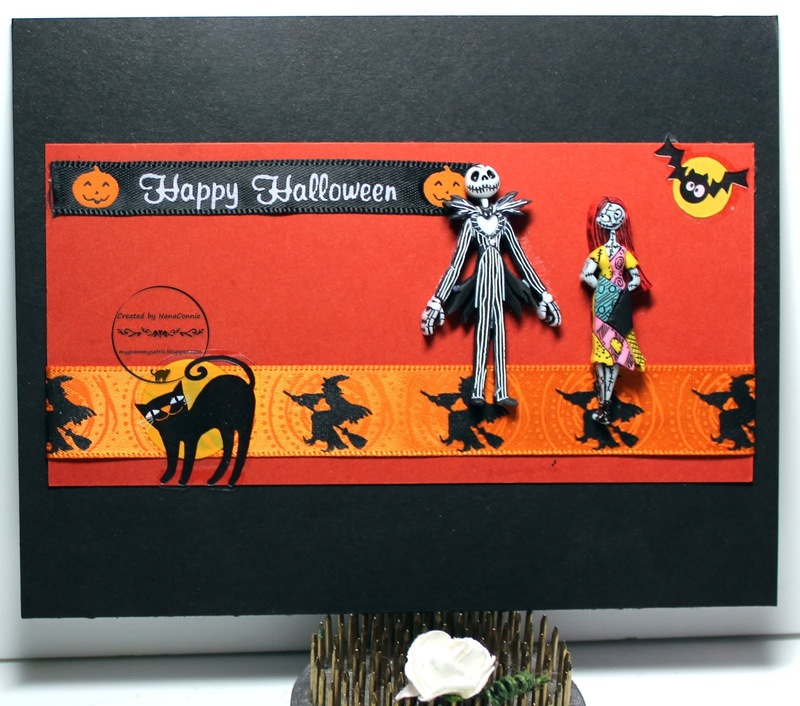 I used Fiskars corner punches on the orange frame, then dug through my Halloween stash for the dp with the spiders and web. 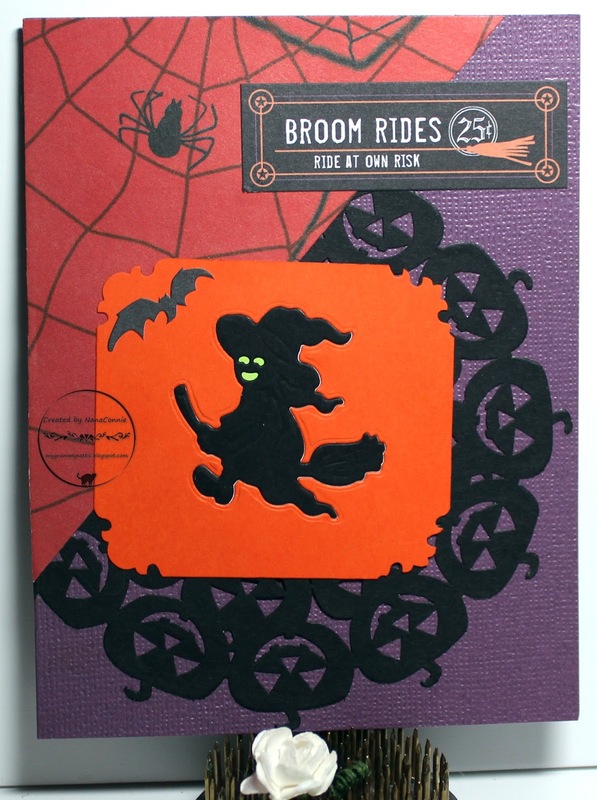 The sentiment came from an old card kit and it seemed perfect for the witch on her broom. Oh, yes, the bat -- it was cut from charcoal gray CS with a punch which is so old the brand name has worn off. I love Fridays! Not only are they the beginning of the weekend but every Friday I get to share another DT project for the challenge at QKR Stampede! I've been on the DT over there for 3 years next month and played in their weekly challenges for at least 2 years prior to that. It's the only weekly challenge team on which I still serve. I love their images and had a huge collection of them before I even joined the DT. Today, I'm using "Bucking Bronc" for our optional theme of "Wild West." We're always have a theme of 'Anything Goes' but each week we give you a new optional theme if you want to use it. The horse was a dream to color and since we are thinking about the Old West in America, I decided to make him a pinto pony. I used my ProMarkers, of course, then cut the image with one of my Gina Marie dies. 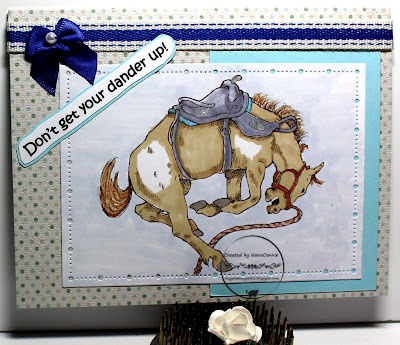 I added the blue and white twill tape and the blue bow, then printed the sentiment, hand cut it, matted it, and hand cut it again before adding it to the corner of the image.